The PVC pouch is common for the early pandas, though I'm not very familiar with them. I think r3globe is correct that they come without capsules for non-proof pandas. The PVC can damage even gold coins, so be sure to get them conserved. 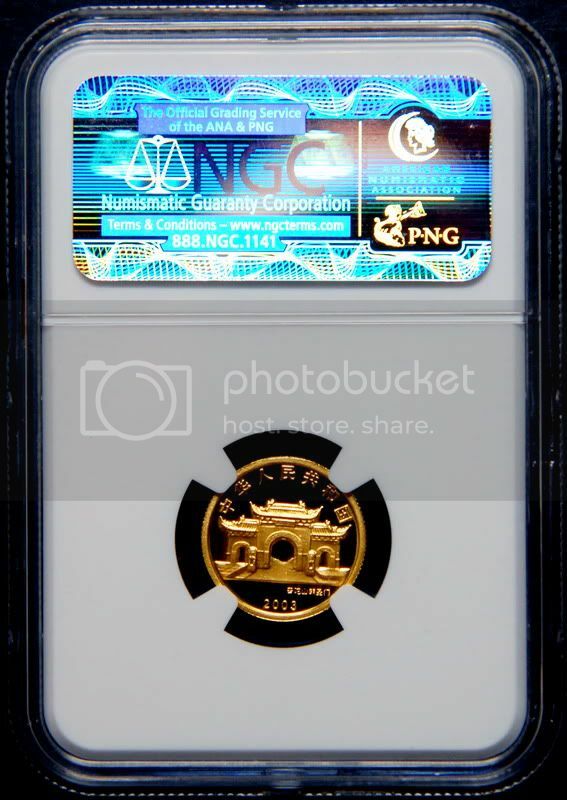 Make sure to note on the NCS paperwork that the coin has PVC residues on it that must be removed. it seems to me, after having browsed the pedia, that 1 oz BU gold only reach a significant premium over spot in the 1995, 1996 , 1998, 1999 and 2005 years...... hmmm.. Except for 2 years the coins with the double seals (capsule + pouch) are proofs, like the 1994 above. Business strike coins get only one pouch. Thanks Peter - Have the March issue been released yet? The China Mint melted Panda coins, coin dealers melted Pandas, jewelers put them in bezels and bracelets and melted them, too. Mintage is irrelevant and even misleading, it's surviving population size that matters. P.S. Second book was shipped a while ago. I can look for the customs receipt to get the date it was sent but unfortunately we can't track the book with it. Maybe it's on a "No Buy" list with customs. Just kidding. The March issue is still in progress. My ANA convention appearance was great fun but took time away from the Pricepedia. I have to catch up now. Thanks peter for the clarification. So, I guess the price of the coin will give you an idea about its scarcity. Sometimes it does but not always. There can be other factors. One example is lack of demand due to buyers’ confusion about the true populations of many coins. Some very scarce coins and varieties are relegated for long periods to "common" status. As long as there is no interest in them there is no movement in price, although it would only take a very small increase in demand to force their prices higher. There are still quite a few instances of price distortions like this in the Chinese market which is part of what makes it so interesting to research and write about (at least for me). Sales is a bit slow in Norway... so maybe try to sell them at ebay? Unless they are real gems I doubt any will bring much above melt value on eBay or elsewhere at this time. A very high grade coin of these dates (particularly the 1989) will bring a decent premium. This is why many gold Panda coins get melted. Eventually, sometimes, the remaining survivors are no longer common and rise in value. Then lots of people say, "Oh, I used to have one of those." 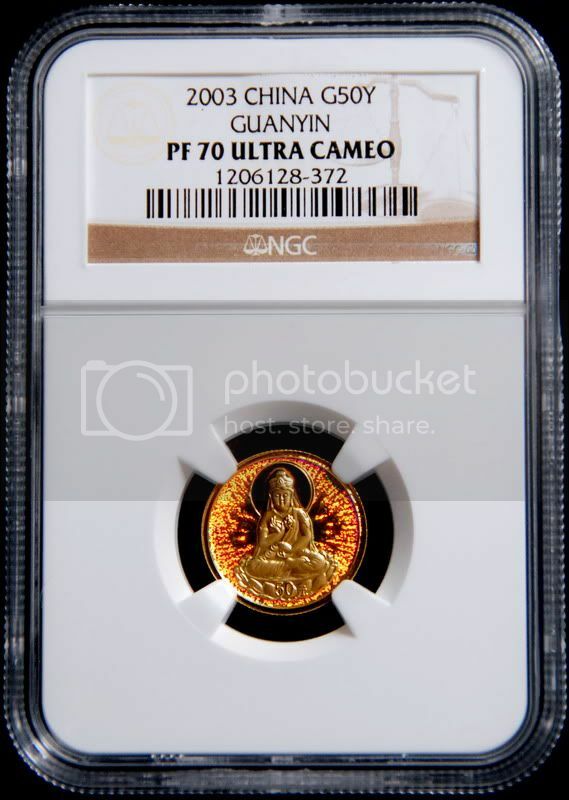 I'm now posting another favourite of mine however this one is not rare but it is the beauty of the coin "Seated Kuanyin" which achieved PERFECT GRADE PF70 from NGC.